OH! 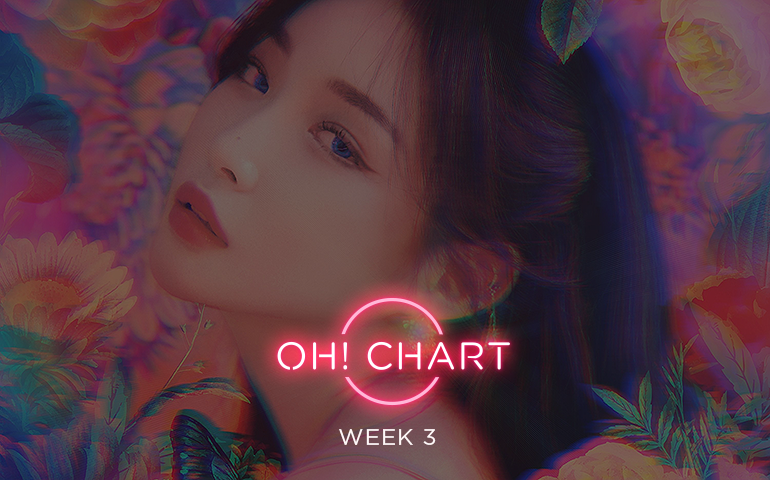 Chart has some surprising results this week as female soloists, Chungha and BLACKPINK’s Jennie, continue to thrive while a blast from the past, MC The Max, makes a big resurgence. 1st place digital winner, K-Rock band MC The Max, makes a grand comeback after a 3 year hiatus with their 9th album. They accumulated 56,921,165 points for their winter-time crooner After You’ve Gone. Next, in 2nd place is last week’s overall winner Chungha, scoring 48,007,021 points with her Cinderella inspired bop Gotta Go. And finally, Ben stays strong in the top three with her song 180 degrees, having earned 40,857,376 points. After winning their first Daesang, iKON claims the physical top spot this week selling 27,176 copies of their repackaged album, New Kids. 2nd place finisher WJSN says move over boy groups, selling 24,219 copies of their 6th Mini Album WJ Stay?. And rounding out the top three is Apink with their 8th Mini Album Percent selling 22,827 copies, proving that fans are loving their new, more mature style. The last category of OH! Chart is made great again by you, the loyal OneHallyu voting public! Chungha places first with 57 votes, a result none of the staff saw coming, as big boy groups were nominated this week. Two votes shy from snatching first place is Apink with 55 votes. And lastly, 3rd place goes to Twice with 45 votes. Don’t forget, just like a presidential election, every vote counts! The overall winner this week is Chungha yet again! She scored extremely high in digital and voting, causing her to jump to 1st place, continuing her reign for the second week. MC The Max makes their big comeback and the public is in love with their new song, thus giving them the edge in digital scores. And in third place this week is BLACKPINK’s Jennie with Solo! Chungha‘s reign doesn’t seem to be letting up anytime soon! She places first yet again this week with her hit Gotta Go, proving her popularity domestically and among the international community. How long will she continue to slay OH! Chart? Let us know your thoughts and predictions in the comments down below!